Mmmm . . . beer. 12.) Perform some cool experiments. 11.) Make a brewing schedule. Ignore it and brew an even more awesome lineup of beers. 10.) Don’t let beers languish in the primary fermenter. Keg them or rack them to secondary promptly. 9.) Don’t miss any Austin ZEALOTS (homebrew club) meetings. 7.) Brew something in way that is as traditional as possible. Brew something else in a crazy new way. 6.) Brew a couple sour wheat beers in the early spring. Add fruits (maybe raspberries and cherries) when they are ripe and in season. 5.) Listen to good music when I brew and don’t be stingy — let the neighbors hear it, too. 3) Follow the rules, when necessary. 3.) Break the rules, when not. 2.) Brew a post-exercise beer. Use it as incentive to actually start exercising again. 1.) Schedule as many brew days with friends as I can manage. 0.) Brew plenty of “ordinary” (but awesome) beers. Brew at least one absolutely insane beer. Nice brewsolutions Chris! 1. Thanks on behalf of the many grateful readers for launching the fantastic beer and wine journal this year. 2. please post those sour wheat recipes when you brew them. They sound soooo tasty. 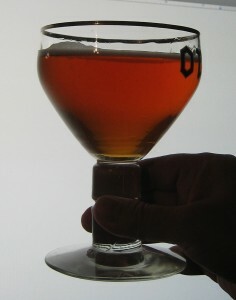 The sour beer recipes will likely be very simple — around 65% barley malt, 35% wheat malt and very low hopping rates. I’ll probably use one of the lambic blend or similar blends available. I’ll post the exact details when I brew them. My particular favorite is #11. That’s my goal for the year, too. If I make #11 come true, I’ll be a happy brewer. That’s a big beer in my book. Good luck with it. I’d like to hear more about this post exercise beer. That could be just the thing to whip me back in shape. My post-exercise beer is just going to be a low-gravity session beer — something I can rehydrate with and not contain more Calories than I expend exercising. If I get ambitious, I may try to add some electrolytes post-fermentation. Not enough to negatively affect the taste, but maybe enough to partially replace some that are lost to sweat, sort of like Gator-ale. I hope the post workout beer or Fit-Beer as I like to call it, gets a spot on Beer and Wine Journal. And oh, I didn’t see a resolution to attend the AHA Conference in Grand Rapids, Michigan this year…. James and I plan on attending.